Description: Exploding tags are scraps of paper inscribed with a special writing, centering around the kanji for "explode" (爆, baku). History: A basic ninja Tool that has been used by all shinobi for countless years now. Description: sharpened, four-pronged metal stars, useful for throwing. Although small, they can be used to distract, or, if accurate enough, can be deadly. They have an open circle in the center, used for grabbing with a finger, to avoid cutting oneself, or to put thread through. The circle is also a benefit in aerodynamics, as it ensures more accurate trajectories. Description: Senbon are metal needles with a point at both ends. They often serve a medical purpose, being used to strike acupuncture points. They have little killing power, but can be thrown with great accuracy. A user with proper medical knowledge can effectively use senbon in battle to incapacitate or even kill their target. To make these needles more effective, the user can poison the tips of the senbon. An added benefit of throwing these at the enemy is that these are smaller than a kunai or a shuriken, making it harder to see and dodge. Abilities: This type of wire is unaffected by the academy escape jutsu so it is able to hold shinobi and commoner alike. Price: Can only by per 10 ft.100 ryo per 10 ft. Description: Makibishi are small, sharp objects that are mainly used to inhibit someone from walking in a certain direction or area, since they would injure the ninja's feet if they tried to walk over them. If a ninja were to step on these spikes then their speed would be halted to almost half. Description: A simple vest tailored to fit the shinobi that purchases it, it is basic cloth, this layer has all the pockets on the chest area that are large enough to hold simple things like vials, scrolls and weapons the size of kunai and below. Beneath this layer of cloth is a solid layer of lead a half inch thick. This lead layer is enough to block weapons with a metal grade of steel and lower but is destroyed by anything higher. Durability: Can protect from any D Rank taijutsu and up to D Rank Kenjutsu. The only things that can cut through this armor, are weapons that can cut through lead or higher. In addition the vest increase the max capacity of basic inventory by five. So instead of ten, you can now have 15 of every basic item. The vest, if destroyed or highly damaged enough to no longer be effective it can be reapired (repairing it cost 1/2 as much as the original price). This does nothing to stop ninjutsu/genjutsu. History: Blades and fists are such annoying things, to nerf these painful encounters ancient shinobi developed armor similar to this and it has been modified over the years to be perfect in battle for durability and mobility. 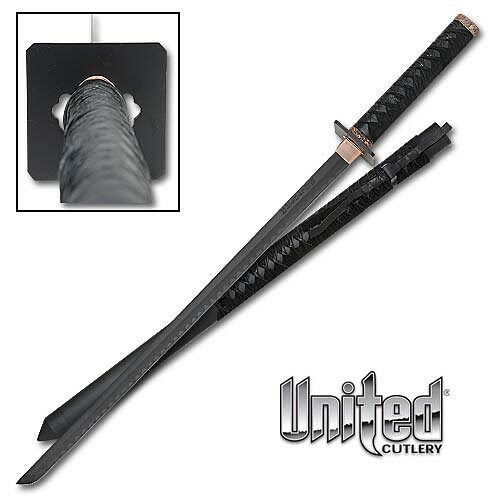 Description: A standard black steel katana that has a 3 foot blade and a 1 foot hilt. The only thing that is different about this katana is the small serrated parts tip of the blade. The affect nothing of the cutting power, but make it so you can strike a solid stone based surface and create a spark. The blade is sheathed in oil that is held within the sheath. History: Even in the ever dark sky of Huoshangakure, there is light. 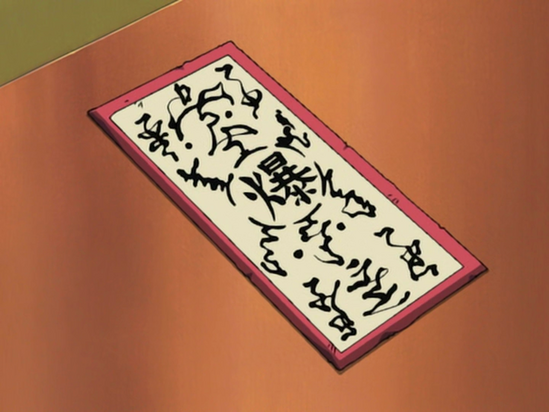 A popular tool among the ANBU of this dark place is a special blade that can be purchased from a single black smith. This blade is commonly referred to as "Oil Burn Blade" because of the oil that coats it. Its original intent was used to be as a torch to help navigate the dark streets from the permanent moonlight, it was later adapted to help in combat. Since the creation of these unique swords, then black smith has died and now only several remain.